Where the Warren Freeway ends in its merge into I-580, most people drive south onto 580 east. The handful of locals or lost drivers who instead take the last exit to get onto 580 west will go through perhaps 580’s most deserted interchange. That’s where the highway builders installed this humble triangle, splitting the freeway exit for the even smaller handful of drivers going east on Calaveras Avenue to Mountain Boulevard and those going west, briefly, on Calaveras and onto the upramp to 580 west. The triangle is paved with river cobbles and populated with natives. The oak trees are easy enough to see in this view from across Calaveras. But what’s that in their shade? 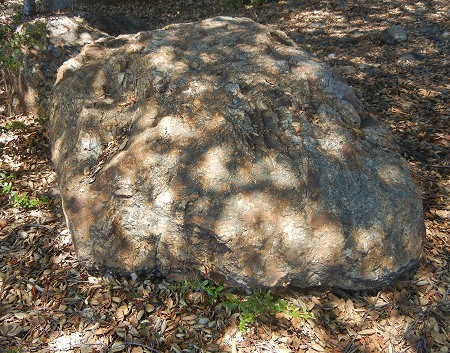 Why it’s one of several large local boulders. I didn’t take notes, but I think these are Leona volcanics, the same stuff that was quarried nearby for decades at the Leona Quarry. Pay them a visit next time you’re walking or biking through that godforsaken area. Sit on them in the shade; they like that. This entry was posted on 8 August 2014 at 5:51 pm and is filed under Leona volcanics. You can follow any responses to this entry through the RSS 2.0 feed. You can skip to the end and leave a response. Pinging is currently not allowed. I did a walk in that very area with the Lion Creek watershed in hand. 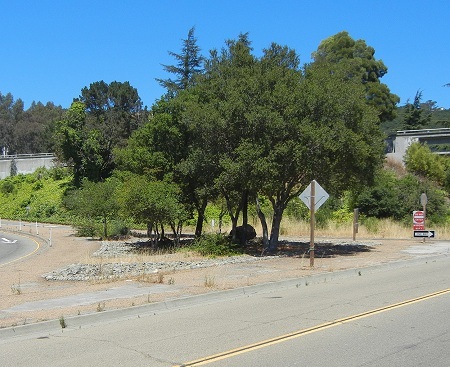 The whole area must have been beautiful, as the main branch of Lion creek is between the north/south lanes of 13, and the terribly altered creek valley bends down into Mills College, just south of Calaveras. There’s a bit of the polluted Leona Creek branch still daylighted to the east, where Calaveras becomes Mountain. Two freeways where all those creeks flowed. So these are errata just sitting where they landed, or did someone place them there? I figure that they were salvaged by the landscapers during the excavations.